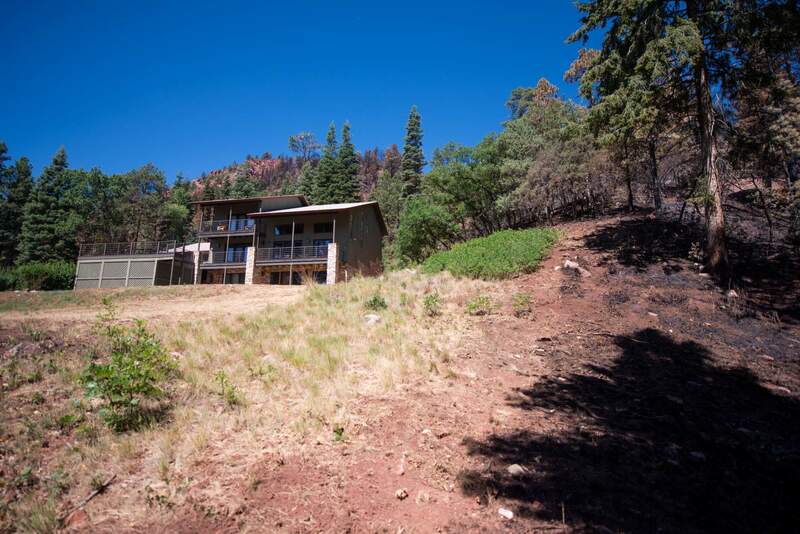 Firefighters bulldozed a line on the right side of this house in Falls Creek Ranch subdivision, northwest of downtown Durango, as part of fire mitigation during the 416 Fire. The line helped stopped the fire from advancing through the subdivision and destroying homes. Every year, residents in the development proactively create defensible space around their homes to help stave off devastating effects of wildfires. This year, it paid off. 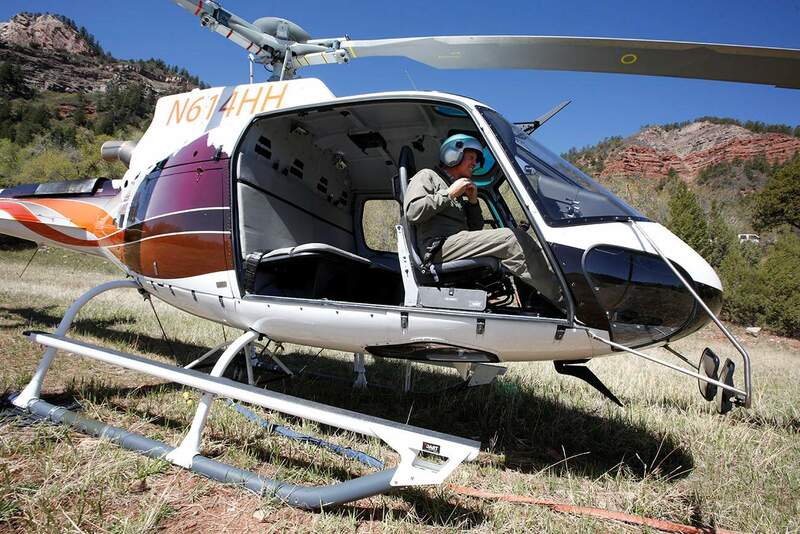 Chief Pilot John Whedon, of Mountain Blade Runner, shows Falls Creek Ranch residents in early May how this helicopter uses a bucket to pick up water out of a pond and then various ways it can drop the water on wildfires. Every year, residents in the development proactively create defensible space around their homes to help stave off devastating effects of wildfires. Wildland firefighters liken their work to poker hands, and when it comes to Southwest Colorado, odds are you’re going to be dealt some ugly cards. “I talked with an incident commander who told me: ‘It’s tough to get a call from Southwest Colorado. Given the terrain, the weather and the density of the forest, we’re almost guaranteed to be delivered a bad hand,’” said Butch Knowlton, director of La Plata County’s Office of Emergency Management. Knowlton spoke to about 50 homeowners who attended a meeting Tuesday night organized by Firewise of Southwest Colorado to recap what went right and what went wrong in combating the 416 Fire. Despite forces of nature that make the San Juan National Forest a firefighter’s nightmare, several things broke in favor of the teams and helped keep the 416 Fire from getting out of hand. The first big break came with the timing of when the fire started: June 1. No other fires in Colorado or New Mexico were burning that day, Knowlton said. He said federal officials provided every resource and piece of equipment the initial team handling the fire had requested. “If we needed this plane, we got it; if we needed that plane, we got it. However many crews we wanted, we got them. The next day we had an air force,” Knowlton said. “If the fire had happened four or five days later, we would have ended up competing with several fires in Colorado and New Mexico. The next break, Knowlton said, was the defensible space homeowners in Falls Creek and others north and west of Hermosa had done to protect their homes from wildfire. Not only did the work protect homes, he said, but it also gave firefighters room to maneuver. That fire-mitigation work done ahead of time was a main reason no homes were lost. Climate change, Knowlton said, is likely to increase the odds that Southwest Colorado will have more fire seasons like this year’s, and it makes it more imperative than ever that homeowners create defensible space around their homes and structures. “People need to realize this climate change deal is real and do fire mitigation,” he said. Richard Bustamante, fire management officer for the San Juan National Forest, said the next break firefighters caught was the arrival of the remnants of Hurricane Bud, that – in June, the driest month in the region – offered about five days of respite from the dry conditions. Crews made the most of their time. “It bought us enough time to put in a fire line and use direct suppression in Junction Creek,” he said. The unexpected rains also gave crews time to build lines to protect Purgatory Resort, he said.